Since arriving in India a little over three weeks ago, we’ve run the gamut on lodging options. We’ve stayed in overpriced, run down hotels, a rodent infested beach shack (Yes, we weren’t the only ones sharing that great view! ), and pleasant guesthouses run by local families. The latter is by far our first choice. Budget hotels in India, thus far, have tended to be institutional, a little (and sometimes a lot) run down and just plain spotty when it comes to cleanliness. Our hotel in Mumbai is the clear winner on crappy lodging. The room cost nearly twice that of any other lodging we have had, it had no windows (a good thing after our all night Bollywood film shoot), the AC was broken and we had to share a bath. Since we only had a private bathroom on two different occasions in New Zealand and Australia, we were pretty used to this set up. This bathroom, however, has a great deal to do with my sensory overload upon arriving in Mumbai. The smell of urine was so incredibly rancid I questioned whether I would be able to handle India. Thankfully, that bathroom has been the exception! At the other end of the budget spectrum is the guesthouse, also known as a home or homely stay. These are usually rooms in a family home run a little like a B&B in the states, but typically not with breakfast. Some have private baths and some shared baths. 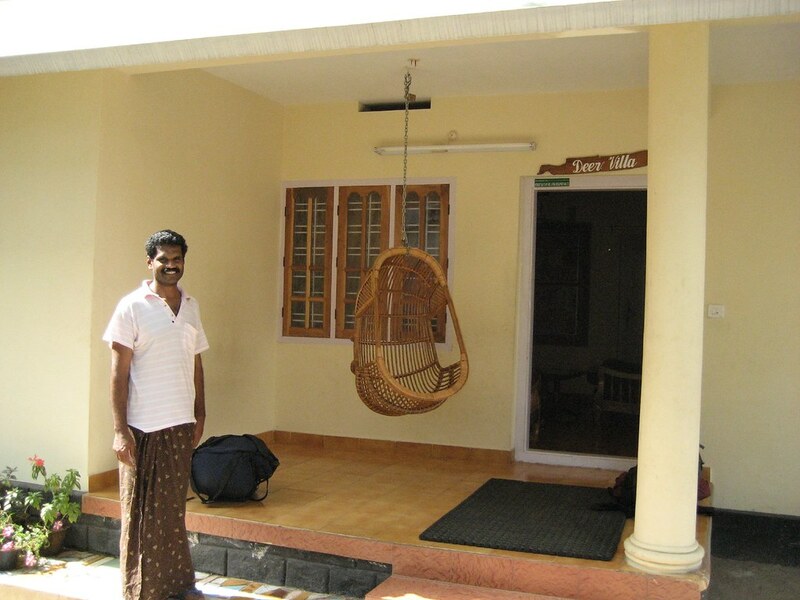 During our time in Kerala, we’ve stayed in three different guesthouses and have had wonderful experiences at all of them. It’s been a great way for us to meet locals and even some Indian families on holiday from other parts of the country. It’s also a much more comfortable and personal experience. At Costa Gamma in Ft. Cochi, we talked with the owner and his family about a range of topics from the cultural and religious diversity of India to who his son’s favorite wrestler is to the perennial favorite “If no one like George Bush, how does he get elected?” In Munnar, the owner shared a hand drawn map and guidance on some local hikes – though we still managed to get lost. He also recommended a guesthouse for us in Kumily. There our host Sabu shuttled us to the national park at 6:30am ensuring that we made it into one of the trekking groups and made us a traditional Keralan breakfast (at no additional charge) which was delicious! All of our hosts were gracious and made us feel at home. A really good thing when you’re living out of a backpack! So if you’re thinking of heading to Kerala for a visit, we highly recommend these places. Both the guesthouse in Ft. Cochi and Kumily are relatively new, so let’s give them a boost!